The first time someone told me about this place, I totally was confused. I was like, "I'm looking for a wedding venue, not a surf club?" And she had to explain that it was a wedding reception venue, and that I could even get married outside on the beach. I dropped by and checked it out and I was thrilled, so that's where we had our wedding. It was so wonderful! They really do have a beautiful location, and our photographs are very idyllic, and just like I always dreamed. It was a truly beautiful ceremony, and they helped us set it all up. The beach house itself is a lovely club house which had plenty of room for all of our guests, and we were the only party that day, which was excellent. No distractions and no noise or crowds that weren't there for us. We had a lot of fun with our friends and family. Food was spectacular too! They had seafood, chicken, vegetable sides and amazing cake! Miller Beach Surf Club is the ideal place to hold a wedding reception. The view of the ocean, and the sound of the water makes for dancing and dining the perfect romantic evening. The food and service were wonderful, and we didn't lack anything we could have wanted or needed. The Miller Beach Surf Club is the perfect location for any event. For our daughters sweet sixteen party we wanted to have a perfect party for her. We choose Miller Beach Surf Club because of the view, not to mention the great food and service. My daughter and all the guests had a really good time. We couldn't have asked for a better evening, except for it to never end. My daughter was turning sixteen (16), and although I really didn't want her to grow up, I wanted the day to be really special for her. My wife and I decided to throw her a sweet sixteen party. We looked at several places to have the party, but we ended up deciding on Miller Beach Surf Club for the event. The Surf Club is in a beautiful location, and the view of the ocean is spectacular. Our meal was better then anything I have had for a long time. We decided to go with their sweet sixteen buffet package. The meal included everything we could have wanted. We had salad, baked ziti, flounder stuffed with crabmeat, chicken teriyaki, and julianne vegetables, top sirloin, sheet cake, ice cream, unlimited soda, coffee and tea, and the kids got to think they were grown up with mocktails of pina coladas, and strawberry daquiris. The price was very reasonable at only thirty eight ($38) per person. The top of the evening for me, I don't know how my daughter felt about it, was a father daughter dance, with the sound of the waves in the background. Made me realize how special she was. If I ever need to throw another event, we will be heading back to the Surf Club. 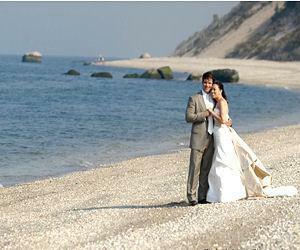 Since I was a little girl I dreamed of the perfect seaside wedding! We took a trip to Long Island to get hitched, and decided after some research that we would go with Miller Beach Surf Club for our reception afterward. The Surf Club has a beautiful, elegant club house with a view of the ocean where you can dance and dine in style and watch the waves. It was a beautiful location for our wedding photos, and a very romantic way to celebrate this step in our lives. Maybe we'll be coming back here for our anniversary! Do you have any experience using Miller Beach Surf Club? If so, please rate your experience and let others hear about it using the form below.